Don't look now, but Labor Day weekend is coming up. Sadly, that is the last hurrah for many folks' grill. 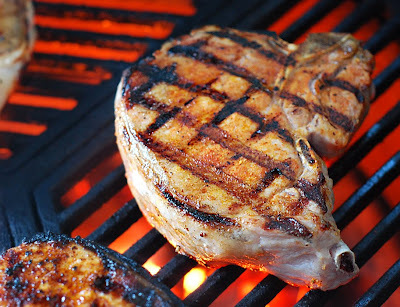 If you are a casual griller and just want to finish up the "season" with something different than burgers and dogs, I'd recommend that you go with some nice thick pork chops. But dinner was delayed for about an hour tonight. I've seen the Blue Angels a few times but I saw the greatest airshow "off" earth tonight. 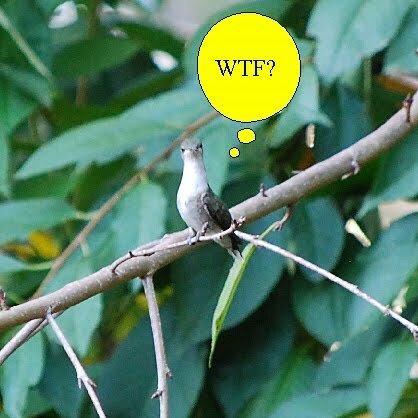 As the sun was setting through the trees, three hummingbirds were swooping, flying, stopping mid-air and dive bombing each other all around our deck, where we have a new feeder. You could hear their wings beating as the raced around us. It was just too entertaining to interrupt by firing up the Egg. I tried getting a shot of their aerial dogfights but the lighting was too low to get a high speed photo. 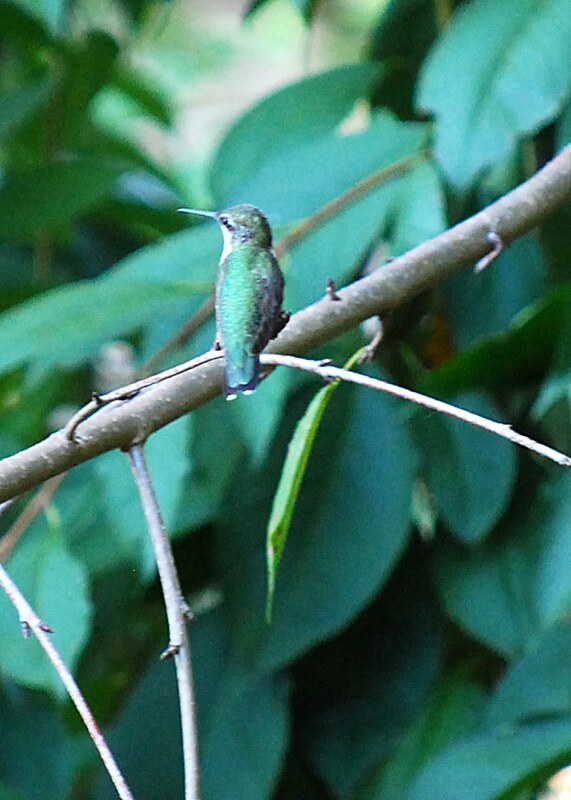 But I did manage to get a few shots when they would perch to catch their breath. Okay, back to grilling. 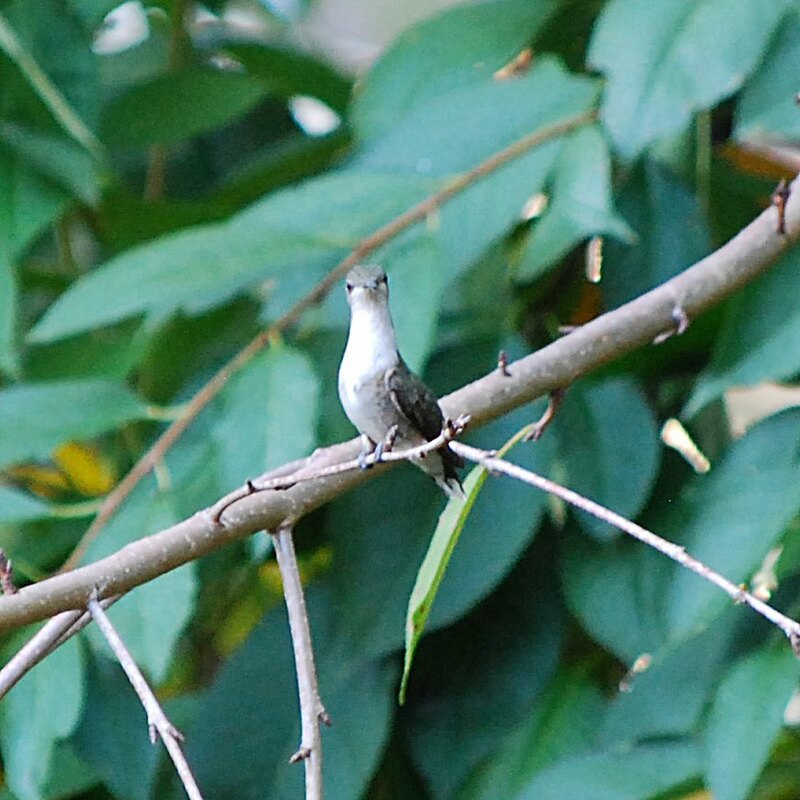 Can you imagine how hard it would be to spatchcock a hummingbird? You might think I am weird, but to me a very nice and thick bone in pork chop is every bit as good as a t-bone steak, when cooked properly. There's the delicious larger white meat side, the smaller yet amazing tenderloin side, and finally, you can't beat gnawing on the meat near the bone of a grilled pork chop. 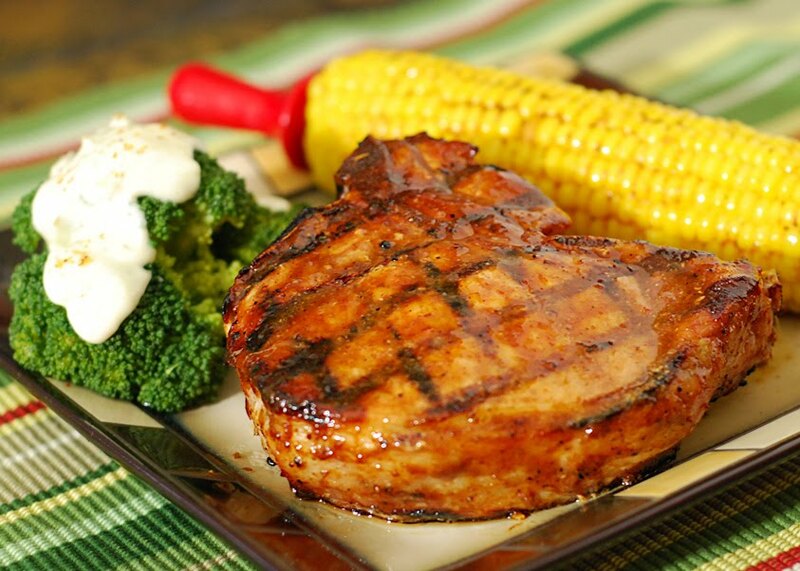 THICK - Get very thick pork chops that are 1 1/2 to 2" thick. I might not have a ruler with me in the grocery store but I just make sure that the chops are thicker than two fingers. BRINE - Soak in a brine to enhance flavor and moisture. RUB - Use a bold rub to spice up the pork. SEAR - Get your grill marks over direct high heat. A cast iron grate helps! ROAST - Finish the chops off over indirect heat to get to proper internal temps without burning the outside. Tonight, I used a different brine that worked very well. This time, I tried searing the chops at a lower temp (450 vs 600f) but longer time than my Porkus Chops Maximus technique. I thought I could get around the roasting part but still get the nice seared outside. I still ended up having to switch from direct heat to indirect heat so I didn't burn the outsides before the internal temp hit my 140f target (before resting). In the last 15 minutes, I brushed them with the award winning Pork Barrel BBQ sauce that I won from Rex at Savory Reviews a while back. I've used this a few times and know why it won Men's Health Magazine's favorite bottled sauce. Good stuff. We served it up with corn on the cob with a barbecue rub butter and broccoli that was topped with a habanero/jalapeno cheese sauce. An overdone pork chop is horrible. But a properly cooked thick pork chop like this is heaven! So what's on your menu for the Labor Day Weekend?